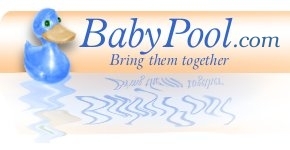 Start your baby pool at BabyPool.com by filling out the form below. By filling out this form you will become the baby pool administrator and will have the privilege and responsibility of setting and maintaining the baby pool options, rules and content. Don't worry there is an option to add other administrators, so if you would like to have others help you maintain the baby pool just add them to the administrators list once you have registered. You will have access to tools that will help you maintain your baby pool as well as send customized invitations, set up polls for your participants and manage your participants guesses. After completing the form below you will have a chance to set up and customize your baby pool. Once you register your Baby Pool will have an Evaluation Status with limited functionality. This will allow you to evaluate BabyPool.com's service before you make a purchase. Purchases can be made in groups of 5 participants up to an unlimited number of participants. All Content Copyright � 1998-2019, BabyPool.com, All Rights Reserved.